Departmental editors often get in contact with us to make requests for changes. We welcome suggestions, but usually we need to collect more evidence before we can make a decision. So we were grateful when No 10 asked us to rename the 'Economic growth' topic by presenting us with evidence that this would help users searching for information about the economy to find this page. They showed us data from Google Adwords, Trends and Hitwise to show that 'UK economy' is a much more popular search term than 'Economic growth'. 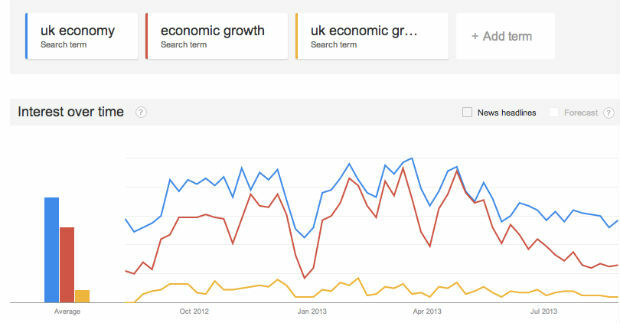 According to Google Adwords, 'UK economy' has 3 times the search volume of 'Economic growth', which is the current topic title. This gave us the right information to agree that changing the title was a good idea, and we were able to make the change quickly. It’s too early to assess whether it has helped more users find this topic, but we’ll be watching the analytics. If you want to learn more about some of these techniques, look at our guide on how to find out what words people are searching for. Other evidence-based work that we've admired from departments recently includes a project by Defra and its agencies to reform all their guidance. They are redesigning the content around user needs by drawing on a number of sources of data, including external and internal search terms, ‘rate this page’ feedback, call centre data and analytics. Based on their early work, they expect to achieve an 80% reduction in content and make their guidance simpler, quicker and clearer for businesses and other users.